Brush cutter teeth could not be more simple. The "S-7" tooth represents our seventh generation in teeth design and alloy refinement. They are proven to be efficient, safe, durable and inexpensive. Costs typically less than one dollar per hour of operation, compared to the six to eleven dollars per hour other brush cutters cost to operate. A simple daily sharpening achieves maximum productivity throughout the tooth life. In contrast, carbide teeth decrease in productivity as they wear so your machine operates at full potential only when they are new. The sharper the teeth, the faster you can mulch, and that is why we designed our "S-7" teeth to be regularly sharpened. Compared to unsharpened carbide teeth, this gives you a constant knife-sharp edge instead of waiting for your production rate to drop enough to justify the cost of replacement. Sharp teeth also decrease wear to the entire excavator/attachment system, because they slice through wood rather than hitting it with a blunt force that sends shock waves through the system. In short; Sharp teeth are the successful contractor's secret to higher productivity, longer teeth life, lower repair costs, and a better looking final product. How often do the teeth need sharpening? That depends on the material being mulched - we recommend sharpening every day as part of a regular maintenance schedule, but with heavy use some contractors sharpen as often as every two hours to maintain maximum performance and output. What should the teeth be sharpened with? 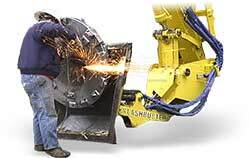 For example, an angle grinder with a 9 inch Brill Tex® grinding wheel works well but there are other brands and sizes that work just as well. Closeup of properly maintained S-7 teeth near end of service life. We strongly believe the "S-7" tooth is the most cost effective and flexible solution for mulching brush and trees. Please contact us for more information. Now available pre-sharpened standard at no additional cost, ready to cut and mulch at maximum efficiency right out of the box! 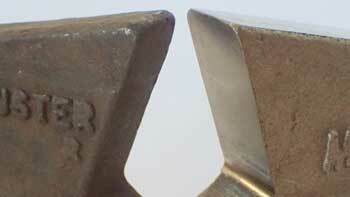 Pre-sharpened tooth on the right, compared to the standard tooth with a small radius on the cutting face edges.